Contemporary in style this rectangular cocktail table will help you step-up your living room. With its floating table top and caster feet this table will bring a modern vibe to your home. The platinum charcoal finish of the wood paired with the gun metal finish on the legs follow with the industrial inspiration for the collection. 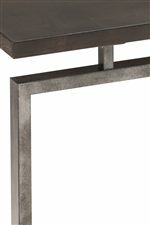 The Alton Contemporary Rectangular Cocktail Table with Casters by Magnussen Home at AHFA in the area. Product availability may vary. Contact us for the most current availability on this product.